Mixture of rye and oats (left plot) and rye and turnips (right plot) in late September. Planting was in mid-August. Photo courtesy of Jerry Volesky. 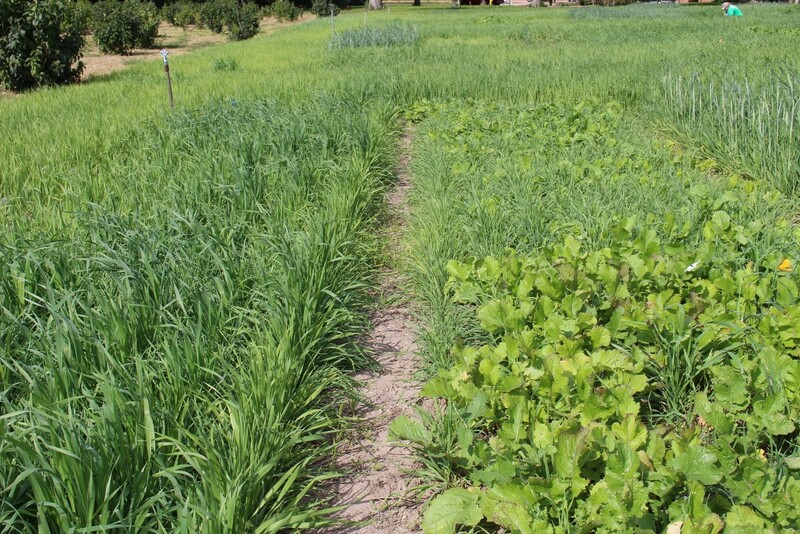 Another option to this practice can be to plant a mixture of winter hardy and non-winter hardy species in order to have both fall and spring forage from a single planting operation. Common winter-hardy species include cereal rye, winter wheat, triticale, or barley. Any of these, paired with a non-winter hardy species, can result in a several different 2-way combinations (Figures 1 https://go.unl.edu/pzjg and 2 https://go.unl.edu/787h). Several 2-way non-winter hardy and winter hardy mixtures were evaluated in recent plot trials at the UNL West Central Research and Extension Center in North Platte (Table 1 https://go.unl.edu/9t4z). For each species in the mix, they were planted at one-half the seeding rate of what would be used for a monoculture planting. In a rye and oats mix for example, oats were seeded at a rate of 1 ½ bushels per acre and rye at 1 bushel per acre. Monocultures of the different species seeded at the full rate were also included for comparison purposes.